Most knowledgeable observers agree that the late Fred Goerner was the greatest Earhart researcher ever. Some I’ve known with a preference for the bizarre and sensational, the “lunatic fringe” of the Earhart community, as Goerner was wont to say, have placed Joe Gervais on this mythical throne, though their numbers are few and growing fewer by the day. I’ve always thought it most unfortunate that Goerner didn’t live long enough to witness the phony Nikumaroro “hypothesis” promoted by TIGHAR’s Ric Gillespie attain the complete media dominance it has attained over the past 20 years or so. Perhaps if the former KCBS radio newsman had not succumbed to cancer and died at age 69 in 1994, the man who wrote the most important book about the Earhart disappearance, The Search for Amelia Earhart (1966) and nearly broke through the stone wall that the Washington establishment erected around the truth since the earliest days, could have made a difference in the way the American public thinks about the Earhart case. 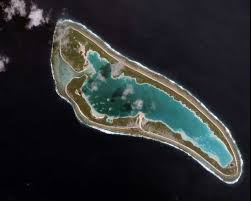 A healthy, vibrant Goerner could have put pressure on the media to be more honest and forthcoming about the sophistry emanating from the TIGHAR camp in its constant attempts to justify the ridiculous travesty that the Nikumaroro canard has become. 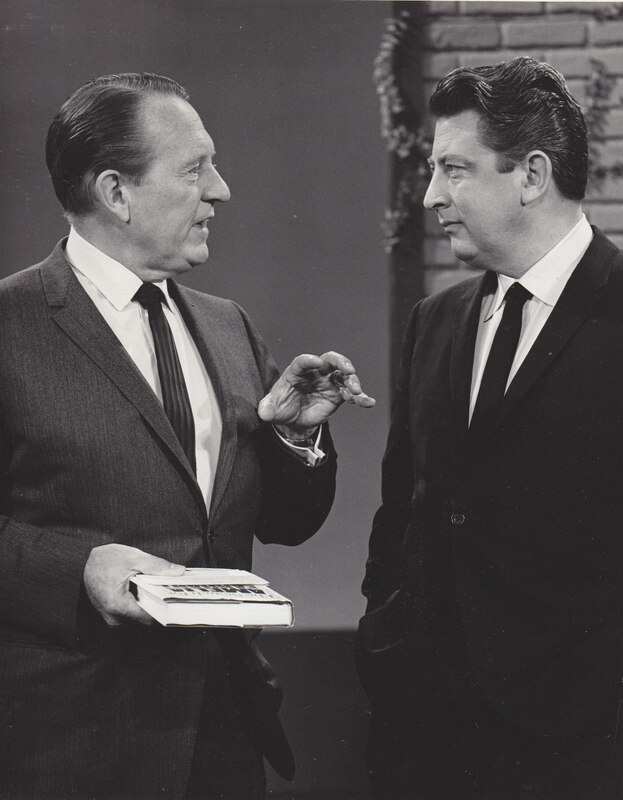 A rare photo of Fred Goerner with Efram Zimbalist Jr., circa mid-1960s. 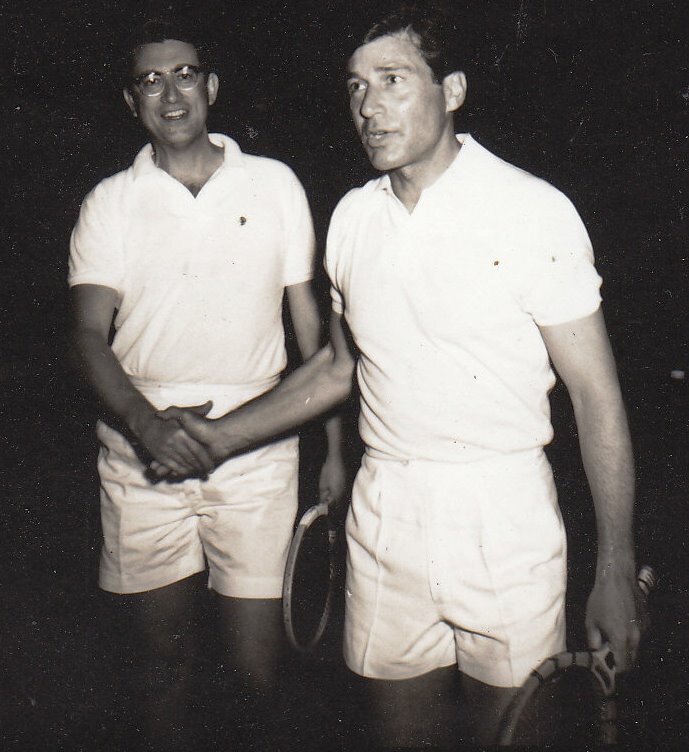 Goerner was a fine tennis player, according to his son Lance, who sent me this previously unpublished photo. The TIGHAR website is replete with all manner of Earhart research material, and even contains two letters from Goerner. Neither of these is the below missive from Goerner to Gillespie, written shortly after Gillespie’s return from TIGHAR’s first trip to Nikumaroro in 1989. The TIGHAR cash cow was still in its infancy, and another year would pass before the infamous falsehood Gillespie uttered at the Washington Press Club, telling the world via CNN that the “Earhart mystery is solved.” This March 1992 farce gained Gillespie instant fame and renown as the world’s greatest Earhart authority — for what amounted to absolutely no reason whatsoever. This is the first of two Goerner-to-Gillespie letters in my possession, the second coming two years later, shortly after the TIGHAR boss was featured in an article he wrote himself in Life magazine’s April 1992 edition. A photo of Gillespie on Nikumaroro in his tropical search outfit, complete with pith helmet, hard at work and immersed in the quest for Amelia Earhart, may have sent an already-ill Goerner to his local emergency in search of a cure for severe nausea. I will leave the rest of the meaningful conclusions to those who can discern them, and get on with the business of presenting the letter from Goerner to Gillespie, dated March 1, 1990. Please forgive the brief delay in answering your letter of February 8, 1990. The questions you posed have required me to research my files which are quite voluminous. I have more than 75,000 documents and letters and notes in my Earhart file alone. When I wrote to Mr. Gerth and spoke with you by telephone last year, I was writing and speaking strictly from memory without reference to any documents. As my involvement with the Earhart matter is thirty years old this year, my memory is far from totally trustworthy. To properly answer you I have dug into a lot of material, much of which I have not perused for a decade or more. With respect to the Floyd Kilts business: One of our KCBS investigative reporters, Bill Dorais, who was deeply interested in the Earhart story, dug into Kilts ‘ claims. Dorais concluded that it was third-hand information at best and totally suspect. Bill became convinced that Kilts had seen FLIGHT FOR FREEDOM in which the female pilot character was supposed to land at “Gull Island” and because Hull Island was a part of the Phoenix Islands, speculation was rife that the Earhart plane had come down on one of the Phoenix Islands. 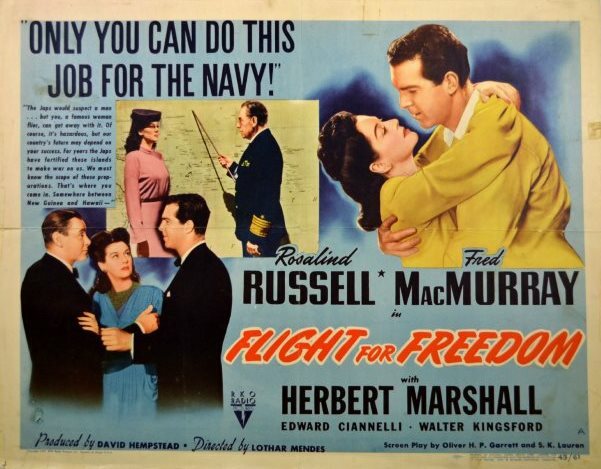 The 1943 Hollywood film Flight for Freedom, starring Rosalind Russell as pilot Tony Carter, who many are convinced was a thinly disguised Amelia Earhart, has been blamed by many uninformed skeptics for much of the so-called “speculation” that Earhart landed anywhere from the Phoenix Island to Saipan. The film was and is a red herring, and has no relationship to the truth about Earhart and Fred Noonan’s Mili Atoll crash-landing and eventual deaths on Saipan. 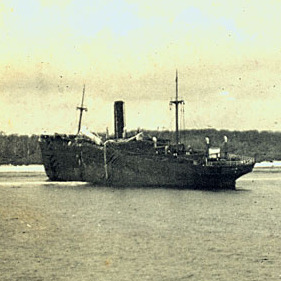 Bill wrote to the Central Archives of Fiji and The Western Pacific High Commission for information, and the archivist, named Tuiniceva, replied that “No skeleton has ever been reported found on Gardner Island.” Bill finally decided (as did I) that Kilts’ story was the result of a corruption of varied events, difficulty in translation, vivid imagination and the traditional exaggeration of the story over the years. I learned more in November, 1968, at the time I took a film crew to Tarawa in the Gilberts to do a documentary on the 25th anniversary the World War II U.S. invasion of Tarawa. I was accompanied by General David Shoup, USMC, Ret. , who was awarded the Medal of Hour for his valor at Tarawa, and five U.S. combat correspondents, who had been part of the Tarawa invasion. The film, TARAWA D+25 was aired in 1969. During our stay at Tarawa in 1968, I had some long conversations with a Mr. Roberts, who was a top assistant to the British High Commissioner. Roberts was sort of an unofficial historian for the Gilbert Islands Colony. I tried out the Kilts’ story on Roberts, and he gathered together several of the older Gilbertese, who had been a part of the colonizing activities at Gardner shortly after the Earhart disappearance. After much conversation and deep-thinking, it was decided that there was a legend about the remains of a Polynesian man being found on Gardner, what year or specific circumstance unknown. They were firm, however, that the skeleton of a woman had NEVER been found. There was, too, a strange story of a woman’s “high-heel shoes” turning up at some point on Gardner. This was a matter of some hilarity. Roberts said he was absolutely certain the remains of a woman had never been found because it would have been a matter of considerable import to everyone. He added that the Polynesian man story was plausible because Polynesians from Niue occupied Gardner Island sometime around the turn-of-the-century. Roberts told me that if I had further interest I should seek out a man named [Henry Evans] Harry Maude, who headed an expedition to Gardner late in 1937. He said Maude was the most knowledgeable man in the world about the Gilbert and Phoenix Islands, and he was considered a world-class historian. Roberts also told me a quite sensational story about the travail of the crew of NORWICH CITY, but I have never found time or motivation to pursue the matter. Henry Evans (Harry) Maude, a former British colonial administrator, head of the Social Development section of the South Pacific Commission, and Professor of Pacific History at the Australian National University. Maude visited Gardner Island, now Nikumaroro, in 1937, 100 days after Earhart’s last flight, and saw no trace of the Electra or the fliers. I did not search for Maude, but recently I have been told that Maude has authored several books about the islands, and he is a Professor at the Australian National University in Canberra. If I were you, I would contact Maude for a full story on Gardner. Finally, Roberts told me that if Earhart and Noonan had been on Gardner they could have survived very nicely as there were plenty of coconuts, crabs and birds which could be caught by simply walking up to them and grabbing them. Several times in the 1970’s I visited the archives in Auckland and Wellington, New Zealand. Basically I was searching for information about the cruiser HMS ACHILLES which was involved in the Earhart puzzle in 1937. I was also interested in why the British through the New Zealanders were so vitally interested in the Phoenix Islands and in particular Canton Island at a time when those interests collided with those of the United States. If you are certain he was British, I have no information that would refute that conclusion. Also, I have no proof that Floyd Kilts was removing the Loran station on Gardner as opposed to constructing it. Bill Dorais got the idea he was involved in the construction. By the way, U.S.S. PLANETREE was indeed a U.S. Coast Guard vessel. It was a 180-foot tender of the MESQUITE 180 (B) Class). Her visual call sign was WAGL-307 (bn CG-140). She was commissioned November 4, 1943. As of 1982, PLANETREE was still on active duty. She was the vessel which delivered the initial construction force to Gardner for the Loran station. For further information, I refer you to Robert Scheina, who is official historian for the U.S. Coast Guard. I’m sure he could get you all of the information about the Gardner Loran installation and the reports that were filed from that installation. He can also give you a complete biography of U.S.S. PLANETREE. Again, with respect to the records found in the archives in Auckland and Wellington, I have neither the time or inclination to give you a full story of the competition between the U.S. and Britain over the islands, but I will give you some highlights of some of the material. H.M.S. WELLINGTON visited Gardner in August, 1935 and accomplished a survey. In February, 1937, HMS LEITH, again visited Gardner, and a British flag was raised on the island and a large marker was constructed proclaiming Gardner as a British possession. Mr. Maude and his Gilbertese people arrived on Gardner sometime in October of 1937. This was separate from the activities which originated in New Zealand. The Gilbert Islands had a severe problem with excess population, and colonizing the Phoenix Islands appeared as a method of easing that situation. On November 29, 1929, the British freighter SS Norwich City wrecked on the reef here during a tropical storm. When a fire broke out in the ship, the crew were forced to wade across the reef and seek shelter on the atoll. Eleven men perished in the endeavor but the rest were later rescued. The SS Norwich City was deemed unsalvageable due to Nikumaroro’s remote location and there it still sits, being slowly eroded by the relentless forces of nature. In November, 1938, a joint New Zealand and British team, which was known by the acronym NZPAS (New Zealand Pacific Air Survey) landed on Gardner. The team was headed by E.A. Gibson, M.W. Hay, R.A. Wimbush, Jim Henderson and Jack Payton. They stayed on the island until January 30, 1939, and they conducted a full survey of Gardner which included setting the boundaries for a landing field and clearing obstructions in the lagoon for a seaplane landing area. The effort was the brainchild of Sir Ralph Cochrane and E.A. Gibson, and it had twin purposes: To prepare the islands for possible use in the event of a war in the Pacific and to claim the islands for Britain for later use for trans-Pacific commercial aviation. The work was accomplished in considerable secrecy. In 1939, the U.S. Navy ship BUSHNELL surveyed Gardner for defense and commercial purposes. The survey also included aerial photographs and mosaics of the island. You of course know of the occupation of the island by the Coast Guard [LORAN station] during World War II and the fact the Gilbertese colony held on until the early 1960’s. During all of this time, no official report was ever filed by anyone which would suggest that Earhart and Noonan landed on Gardner in July, 1937. The above information was what finally dissuaded Fred Hooven from the Gardner conclusion. By the way, despite our conversation of last year, nowhere have I seen you acknowledge that your recent efforts were motivated by the work of Fred Hooven. As you well know, the information did not originate with Mr. Willi or Mr. Wade. Though Fred Hooven has been dead for five years, responsible researchers have the obligation to identify their sources of information. As I wrote to Mr . Gerth and as I discussed with you by phone last year, I knew the pilots Lambrecht, Short and Fox of U.S.S. COLORADO. They were not fledgling flyers. They were seasoned U.S. Navy aviators, and they would have liked nothing better than to find Earhart and Noonan. To suggest that they saw signs that someone was living on Gardner and simply ignored them is an extreme insult to their memories. 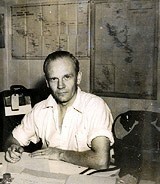 John Lambrecht assured me that they were totally convinced that Gardner and the other Phoenix Islands with the exception of Hull Island were uninhabited. His “signs of recent habitation” on Gardner were undoubtedly the markers left by HMS LEITH in March, 1937. At the risk of making you angry, I feel I must say several things to you, Mr. Gillespie. Formerly known as Gardner Island, Nikumaroro, part of the Phoenix Islands in the western Pacific Ocean, has been the focus of many false claims made by Ric Gillespie and other TIGHAR members. Contrary to Gillespie’s phony assertions, nothing found on Nikumaroro in 11 visits by TIGHAR has been ever been connected to Amelia Earhart or Fred Noonan. Given the number of people who lived on or visited Gardner since 1937, there must be a mass of debris there, and the more logical conclusion is that these items belonged to those people rather than Earhart and Noonan. There must be many old batteries there. The Coast Guard used them for many purposes . Anyone could have lost a cigarette lighter. And “a boxlike piece of metal with a serial number on it (that) may have enclosed radio equipment” is more logical to the Coast Guard. Metal was at a premium on Gardner where the natives were concerned for many purposes including catchments for rain. I’m sure the Coast Guard personnel gave the natives anything they could. That ‘s the way it was during WWII . Also remember that U.S. planes flew into Gardner during WWII to re-supply the Coast Guard station and to deliver mail. Once you float “possibilities” to the media and there never is a follow-up, it catches up to you and credibility plummets. The hardest thing in the world is to come back from an expedition and tell the media and friends and members of your organization that nothing was found that could be identified as belonging to Earhart or Noonan or their plane. I know that because of personal experience. The only thing that will write an end to the Earhart mystery is positive identification of their aircraft or their remains. That does not mean a piece of metal or some unidentified human remains. It means NUMBERS from the props, engines or instrument panel or remains that can be identified by dental charts. If you return to Gardner, don’t bring back more “maybes” for publicity. If you bring something back, be absolutely positive you have clear identification before making the search for Earhart and Noonan more of joke than it already is. As I discussed with you by phone and as I wrote to Mr. Gerth, Fred Hooven and I dismissed the possibility of Gardner or McKean because of the massive amount of information that made such a conclusion illogical. We arrived at the conclusion that the most logical places to search were the tiny reefs which lie between Howland Island and the Phoenix Islands. I have asked the U.S. Navy to search those bits of coral, and I’m hopeful they ill do just that some time in the not distant future. You must remember, too, that the direction finders circa 1937 were not considered to be accurate at distance closer than 5 degrees. That information was given to me by captain August Detzer, USN, (Ret. ), who in 1937 was head of OP-20-GX, the direction-finding division for Naval Intelligence Communications. If you want further information, don’t hesitate to ask. Good luck with your organization and any further searches. Simply remember to provide all information to your membership and investors, and use the media carefully. They will not remain tolerant of “maybes” forever. Note Goerner’s closing statement, in which he gently warned Gillespie that the media “will not remain tolerant of ‘maybes’ forever.” In 1990, four years before his death, Goerner simply had no way to foresee the depths of dishonest advocacy for TIGHAR to which the American media would eventually sink. Nothing demonstrates the artificial, contrived nature of the Nikumaroro scam better than the fact that merit or results have nothing to do with the media’s enthusiasm for it. Few if any are as disgusted by this absurd phenomenon as I am. Goerner and Devine reach out to Muriel Morrissey: Did Amelia’s sister know more than she let on? 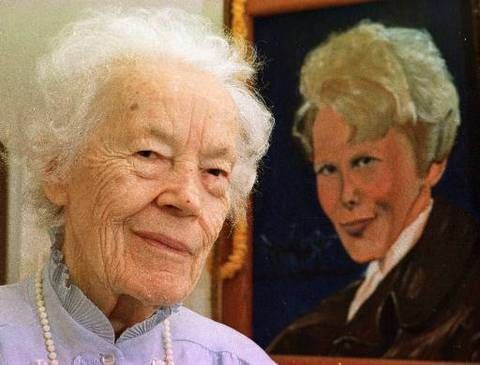 Grace Muriel Earhart Morrissey, Amelia’s favorite childhood companion and her only sibling, is an often-overlooked character in the Earhart saga. Unlike Amelia, Muriel was blessed to live out a long, productive life, dying at 98 at her West Medford, Mass., home. She was a unique individual in her own right, and deserves to be remembered. 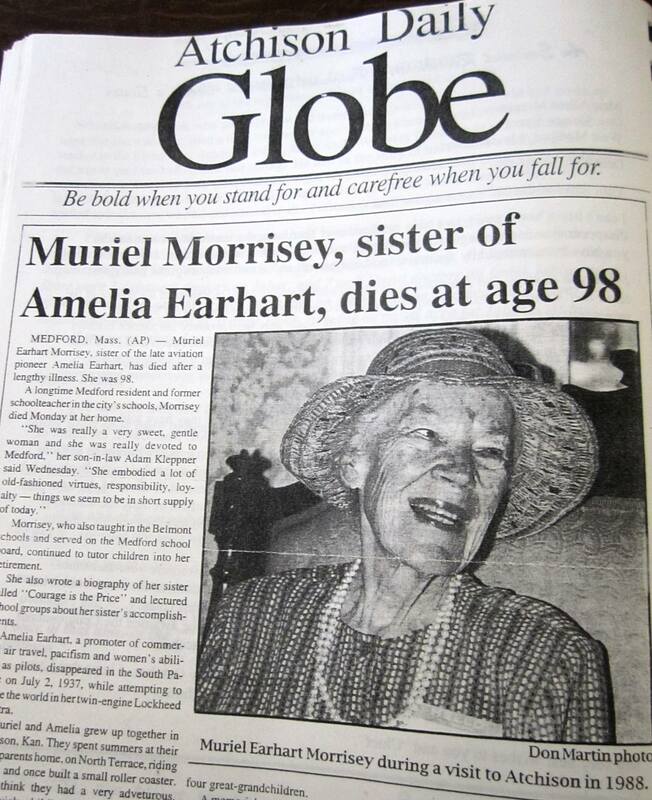 “Muriel Morrissey was a charter member of the Medford Zonta Club, a worldwide service organization of executive women in business and the professions, founded in 1919,” wrote Carol L. Osborne, who, with Muriel, co-wrote Amelia: My Courageous Sister, self-published by Osborne in 1987. Muriel wrote an earlier biography of Amelia, Courage is the Price, in 1963, and in 1983 she wrote and self-published The Quest of A Prince of Mystic Henry Albert Morrissey “The Chief,” the biography of her beloved husband. Muriel could never have dreamed the way her life would change after Amelia’s tragic loss, and we can only imagine how she agonized over her sister’s disappearance. The massive publicity, unwanted attention, false leads and dead ends that the never-ending search for her famous sister created must have brought her to the brink on many occasions. At least, this is the “conventional wisdom” about Muriel, as well as her mother, Amy Otis Earhart; George Putnam, Amelia’s husband; and Mary Bea Noonan, Fred’s widow. It could well have been that way, but some researchers, including this one, have wondered whether Muriel, Amy, Putnam and Mary Bea could have been let in on the truth about Amelia’s Saipan fate by the feds and sworn to secrecy and silence in exchange for the kind of closure that families of missing loved ones long and pray for. Telling the Earhart and Noonan families the sad truth would have made sense for the feds from a practical standpoint: With the Earhart and Noonan families fully informed, the government wouldn’t have to deal with the messy and noisy distractions they could have created in the media had they been kept on the outside of the establishment stonewalls that Fred Goerner nearly broke though during his early 1960s investigations. You know, Neta, up to the time the Japs tortured and murdered our brave flyers, I hoped for Amelia’s return; even Pearl Harbor didn’t take it all away, though it might have, had I been there as some of my dear friends were, for I thought of them as civilized. Amy lived with Muriel in West Medford from 1946 until her death in 1962 at age 93, so it’s safe to assume that Muriel knew everything that Amy did. Thus, for the government to have officially shared the truth with the Earharts would not have been surprising. After all, despite the media’s insistence that Amelia’s fate has been a “great aviation mystery” from the first moments of her loss, the truth about her Marshalls and Saipan presence and death has been an open secret since Goerner presented it for all to see in his 1966 bestseller, The Search for Amelia Earhart. Since Goerner’s book, 50 years of investigations have added a mountain of witness testimony that has illuminated the obvious for all but the most obtuse or agenda-driven. Just when this may have occurred is anyone’s guess; they might have even been allowed to quietly bury Amelia and Fred in unmarked graves. No probative evidence has surfaced that supports this idea, but nothing we know precludes it, either. In fact, Muriel’s public statements to Fred Goerner, Thomas E. Devine and others in later years that she endorsed the Navy’s conclusions are far more surprising, in light of her mother Amy’s famous statements. Your letter of the 27th meant a great deal to me. I can’t begin to tell you how I have agonized over continuing the investigation into Amelia’s disappearance and writing the book which Doubleday is just now publishing. I know how all of you have been tortured by the rumors and conjectures and sensationalism of the past years. The Admiral told me without equivocation that Amelia and Fred had gone down in the Marshalls and were taken by the Japanese and that this knowledge was documented in Washington. He also said that several departments of government have strong reasons for not wanting the information to be made public. Mrs. Morrissey, regardless of what the State and Navy Departments may have told you in the past, classified files do exist. I and several other people, including Mr. Ross Game, the Editor of Napa, California REGISTER and Secretary of The Associated Press, actually have seen portions of these files and have made notes from their contents. This material is detailed in the book. I am sure that we have not yet been shown the complete files, and General Wallace M. Greene, Jr., Commandant of the Marine Corps in Washington, refuses to confirm or deny the testimony of many former marines that the personal effects of Amelia and Fred and their earthly remains were recovered in 1944. Please believe what I am saying. If justice is to be achieved, it may require your assistance. You know I have the deepest respect for Amelia and Fred. My admiration for their courage has no limits. They should receive their proper place in the history of this country. A San Francisco newspaper editor wrote the other day that Amelia and Fred should be awarded the Congressional Medals of Honor for their service to this country. I completely concur. I shall be in Boston sometime toward the end of September or early October. I hope that I can meet with you at that time and bring you up to date on all of our efforts. Goerner had known Muriel since October 1961, when he traveled to West Medford, Mass., to ask her for permission to submit the remains he had recovered on Saipan during his second visit there, about a month earlier, for anthropological analysis. For a time, Goerner thought it possible that the bones and teeth he excavated during his second Saipan visit, in September 1961, might have been those of the fliers, but he was soon disabused of that idea when Dr. Theodore McCown determined that the remains were those of several Asians. Before he engaged with Muriel and her husband, Albert, better known as “Chief,” Muriel told Goerner she believed that Amelia “was lost at sea,” and that “a crash-landing on the ocean was more likely than capture by the Japanese.” But after her meeting with the charismatic newsman, Muriel changed her mind, and sent letters to officials granting Goerner permission to have the remains evaluated. 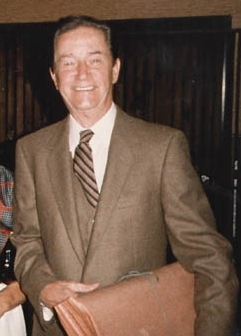 Thomas E. Devine, the late author of Eyewitness: The Amelia Earhart Incident, one of the most important Earhart disappearance books ever, had his own ideas about where Amelia was buried, and he visited Muriel in West Medford in mid-July 1961 to appeal to her for information she might have had about Amelia’s dental charts. Otherwise, she told him that many years of false and irresponsible claims had taken their toll on the family, and she had resigned herself to accepting the Navy’s version that Amelia and Fred were lost at sea near Howland Island. Muriel’s generosity to Devine was short-lived; two years later, in 1963, she refused to grant him permission to exhume what he was convinced was the true gravesite on Saipan. Thomas E. Devine, circa 1987, wrote about his visit to Muriel in his 1987 classic, Eyewitness: The Amelia Earhart Incident. Devine’s visit with Amelia’s sister was memorable nonetheless, for reasons that could very well be directly related to the possible scenario suggested earlier. In a day filled with strange and unnerving occurrences, Devine only later realized he had been trailed — actually escorted — by ONI agents throughout his entire trip to West Medford. After their visit and just before Devine left, Muriel went to a window and raised and lowered a window shade to its full length. Saying she would return soon to say goodbye, she left the room to attend to her mother, who was bedridden and living in the Morrissey home. When Muriel left the room, Devine looked out the window. Standing a short distance from the house, he saw the same cabby who met him at the depot talking to another man. Upon departing the house, Devine walked down the hill. The two men had disappeared. As he rounded the corner, looking for transportation back to Boston, the cab driver suddenly appeared, and directed him to the nearest stop on the MTA that would shuttle him back to Boston. Stopping for lunch at the depot restaurant before taking the train for New Haven, Connecticut, Devine watched from the counter as two men and a woman entered and took a table at the near-empty restaurant. The woman then walked behind the counter where he was seated, and went into the kitchen with Devine’s waiter. Devine said he paid little attention to their whispered conversation, but heard the woman ask the waiter for an apron. She then began serving the two men at the table behind Devine. Suddenly she told Devine, “You’ll have to sit at one of the tables or I can’t serve you.” Devine initially said nothing, but the woman persisted. He then agreed to move, as he wanted a cup of coffee. As he turned, Devine saw the cab driver and the man who had been talking to him outside the Morrissey home. He pretended not to recognize them, and they seemed not to notice him. Muriel Earhart Morrissey, circa 1989, West Medford, Mass. Did she know the truth about her sister’s sad fate all along? “After I was seated, the two men began a real show,” Devine wrote in Eyewitness. “The woman encouraged me to speak to the men about their foul language, but I declined; then they pretended to argue. ‘Here I invite you in for a drink,’ the cab driver roared, ‘but you don’t reciprocate!’ ” At their table, Devine saw three full beers in front of each man. Again the woman insisted that Devine speak up, but he refused. The cab driver then pounded on the table, threatening to beat up the other man. Suddenly, they left the restaurant. “Amazingly, the woman urged me to go out and intervene, but I had seen enough of this ridiculous charade,” Devine recalled. “I was not about to be relieved of my briefcase. Instead, I left the restaurant by another door. Shortly, who should I spy amidst a group of passengers in the depot but the cab driver! As I looked toward him, he turned his head. “Finally my train arrived, ” Devine went on, “and I boarded, but there was the cab driver, also boarding. Thoroughly unnerved, I walked to the last car and stepped off just as the train started moving.” While he waited for the next train to New Haven, Devine said he decided to return to the restaurant “to risk a cup of coffee. The same waiter was behind the counter, but the ‘waitress’ was gone.” Devine asked the waiter where the woman was, receiving only, “She left,” in response. I was haunted; the woman looked familiar to me. Slowly, I came to the astounding realization that this woman was the “waitress” in the Boston depot! The woman must have sensed that I recognized her, for she immediately excused herself. Hastily the remaining ONI agent informed me that there had been no further investigation of Amelia Earhart’s grave. I left the meeting convinced that the people who had accosted me in Boston were agents of the Office of Naval Intelligence. Why their presence in Boston on the day of my visit with Mrs. Morrissey? I cannot say. Mrs. Morrissey did tell me that she had informed the Navy of my intended visit. But why would the ONI trail me to West Medford? I don’t know. What was the purpose of the ONI agents’ peculiar antics in Boston? That I do not know, either. Perhaps they were trying to frighten me into curtailing my investigation. The bizarre fiasco acted out in the Boston train depot restaurant by ONI personnel defied explanation, but it did expose the agency’s awareness and interest in Devine’s meeting with Muriel Morrissey. It also demonstrated that Muriel had a confidential relationship with the Navy, the roots and nature of which were never made public by the Earhart family. Thus, we can still reasonably ask whether Muriel knew the truth about Amelia’s demise on Saipan, and when she knew it. The answer to that question, of course, will probably never be known.